Howdy! 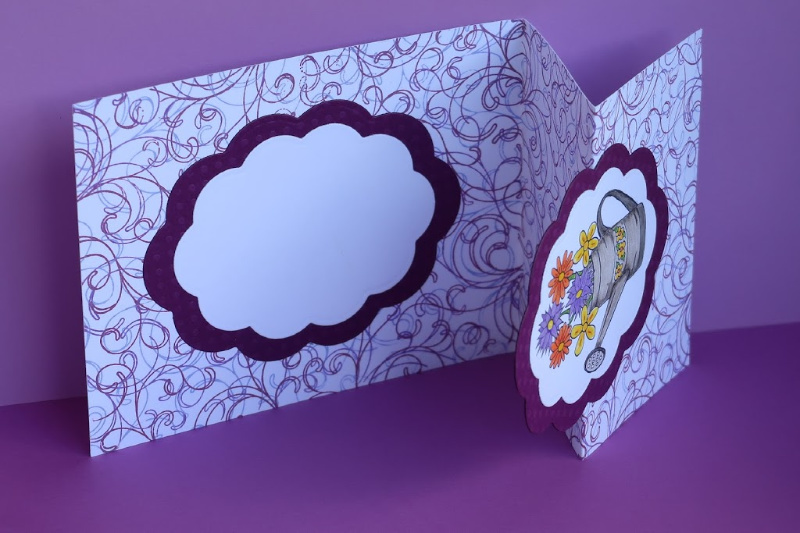 I am over at a2z Scrapbooking with a Z fold card. 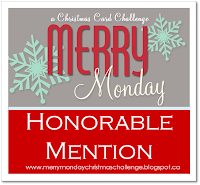 Fold cards are very new to me and they are the theme of our April Monthly Challenge. 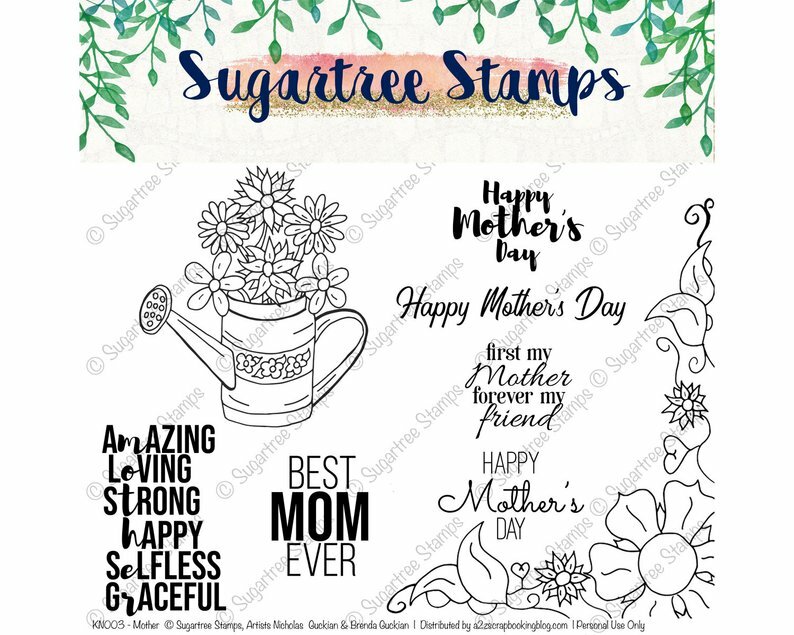 I used the Sugartree Stamps Mothers Digital Stamp to create my card. It is available in the a2z Scrapbooking Etsy store. 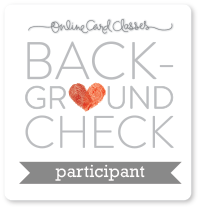 Feel free to use my discount code karen15 to get 15% off your purchase of $25 or more at the a2z Scrapbooking store. Here we go with possibly my first fold card. I was excited about doing this so that I could learn something new. There will be more photos making the fold much more clear. I got the idea from Jennifer McGuire’s post. And here is her card. Nice as always. Back to my card.. I cut a piece of Neenah paper down the center vertically. 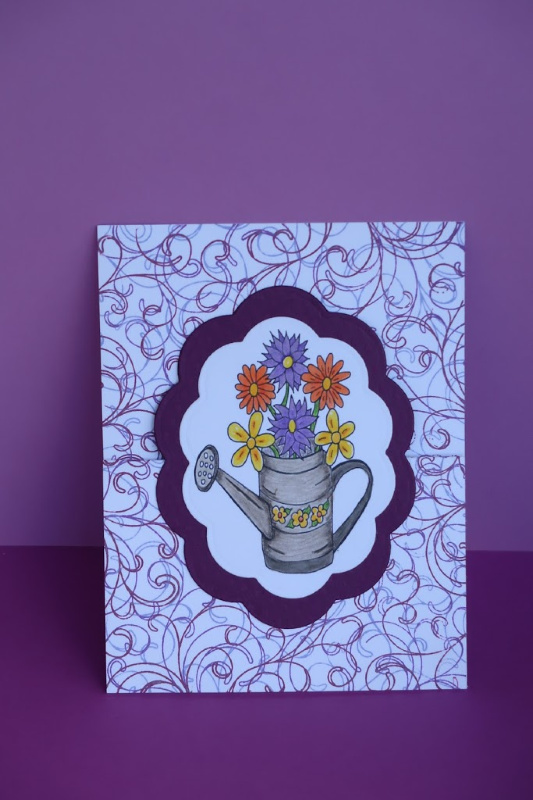 I used a Hero Arts background stamp and stamped it 3 times with 3 different Distress ink colors. 2 times I shifted it but kept it in the same direction and 1 time I turned it a quarter turn and stamped across the card. 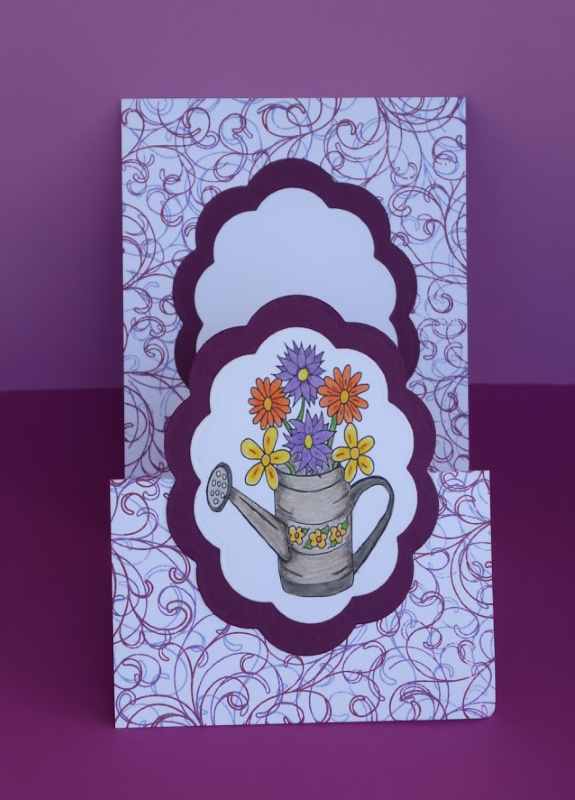 The watering can and flowers image is from the Sugartree Stamps Mothers digital set. I sized it and then printed it on some Neenah paper. I did all the coloring with Prismacolor pencils. I need to bring them out more often. 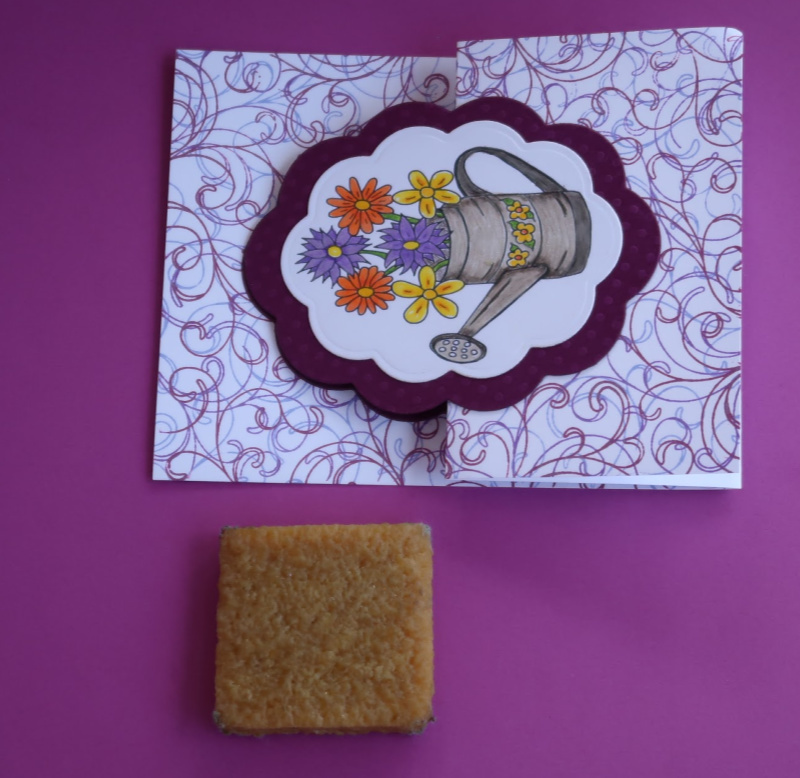 I used a Spellbinder die to cut out the watering can and the mat under it. Now for the fold part and the gotcha part. So that long stamped piece of paper gets folded in half with the stamping inside. Then the front piece gets folded again downwards. I cut out a duplicate of the two scalloped ovals. One is with the image and the other on the “inside” of the card to write a message. And the gotcha is when you are gluing down the oval with the image on it. Do not apply glue to the entire back of the oval since part of it hangs off the card. 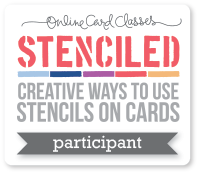 You will never guess who did that and as soon as I closed the card… oh no! I quickly pulled it apart. I cut out one more purple oval and glued it to the back of the image oval to cover all the darn glue. Then I glued it on correctly. I am not used to have things hang off a card. Now I also have a bit of glue on the “inside” oval. Us card makers have our tools and I have a gum eraser that removes glue thank goodness. Problem solved! One more look at the card.. 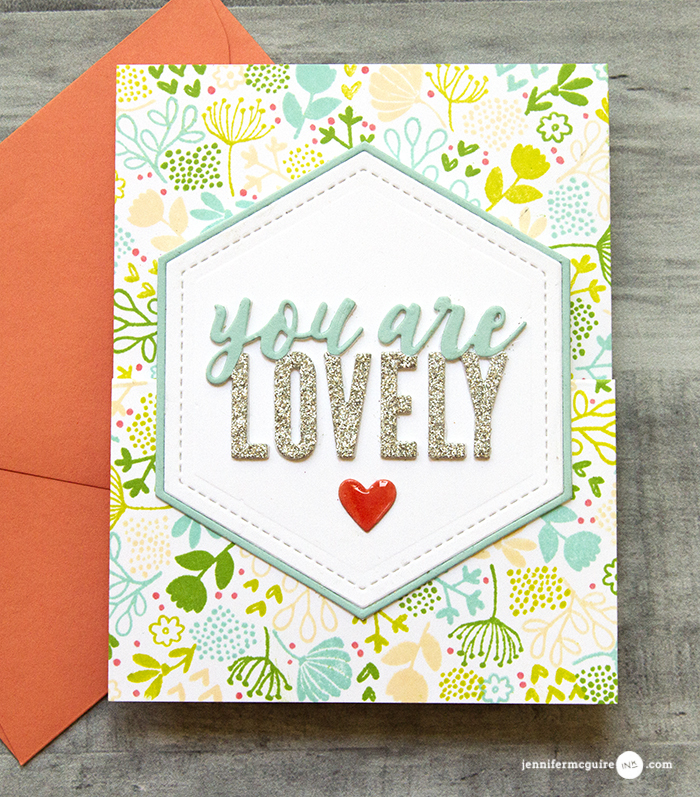 Please join us in this month’s “Fun Folds” challenge for your chance at a free digital stamp set AND, if you used Hero Arts or Sugartree Stamps, a $20 gift card to our Etsy store. Oh this is so pretty!! I want to try this fold too!